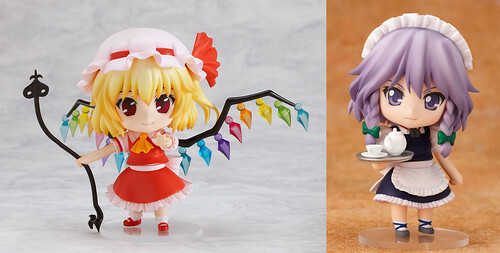 Nendoroid Flandre Scarlet and Izayoi Sakuya Get a Re-Sale! That said, I would like to apologize for the inconvenience caused by the post. I have modified this post to reflect on the changes. GSC’s latest Nico Nico broadcast that was conducted yesterday revealed several stuff there, including some Nendoroid to be put on re-sale. As you can see in the pic above, it seems that the re-sale of Touhou Project duo Nendoroid Flandre Scarlet and Nendoroid Izayoi Sakuya has been approved by GSC. Well, what do you think about the re-sale, Nendonesian? This entry was posted in News and tagged flandre scarlet, izayoi sakuya, nendoroid, touhou project. Disappointing but it doesn’t stop them doing more of them at a later date. Yoshika was a Phat Company release originally as well, so not entirely in GSC’s control. Maybe they’ll re-release when they’re closer to releasing some of the other Strike Witches nendoroids they’ve been working on. I hope so, at least, she’s pretty much the only one in the top 50 that I’m interested in and don’t own already. Skipped originally because she seemed like a once-off but now that they’re slowly doing the rest of the characters I want a set. I’m actually super happy they are rereleasing Flandre! But Sakuya… not so much. well, the re-release is something full of contradiction..
in profit-wise, I think GSC must re-release those figures…. and for figure sellers who keep their rare figures in high price, this will kill the price.. but still they got some profits from selling the newer ones..
GSC, Y U make this Touhou re-release instead make a new Touhou nendos, (like Patchouli, yes!)? if you want to re-release.. just re-release the MOST memorable serie, maybe like sayonara zetsubou sensei. I have a feeling there were already plans to re-release them (Flandre especially) so its just convenient for them that they were on the list. as far as Touhou goes, I’m personally waiting for Reisen, but whatever. Hopefully more re-release plans will be announced soon and we dont hafta wait until Summer WonFest or something. This is doesn’t mean that they won’t re-sale the ones in that were in the top five of the results.They’re probable trying to go for variety.I still see this as pretty fair even though it’s not the ones that I wanted.Flandre Scarlet was still at the top of the list,she wasn’t in the top five but she was still up there pretty far.Maybe just wanted to release two Touhou figures together.Seeing that they re-selling a figure last on the list maybe this will give other figures that were pushed down the list by all those Mikus a chance. I just hope Itoshiki Nozomu gets resold when I have money to buy him. Could I get the link to where you found these? I might be get Reimu, but the one I most waiting for the the Card Captor Sakura, I’m such a Huge fan of Clamp and I had wish they would release Nendoroids from their series.